Social scientists say that minor imperfections—quirks if you will—can heighten endearment towards their possessors. That was just the case with last Friday’s wonderfully weird old Saab, which was embraced for its oddball nature and its kooky peculiarities. It’s price was just the right amount of zany too, and that worked toward its sealing the deal on a solid 76% Nice Price win. Yay weirdos! 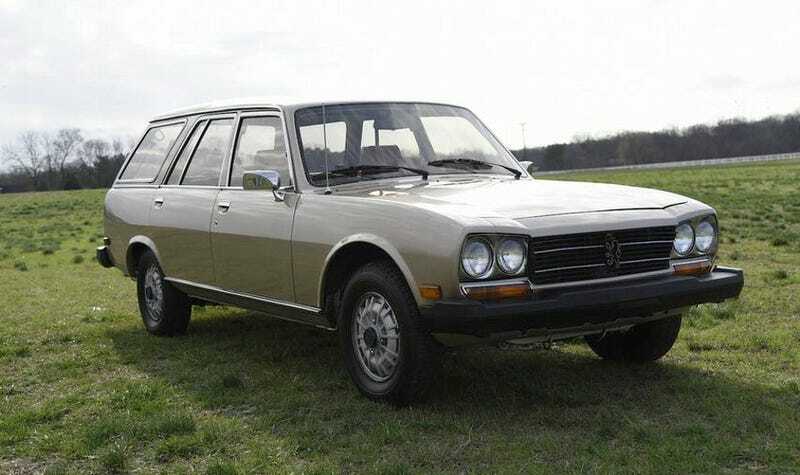 Okay, if you think that Saab had personality, wait until you get a load of today’s 1982 Peugeot 504 wagon. This is the sort of car you envision racking up a million miles criss-crossing the African Savannah, or taxiing tourists through places that maybe they shouldn’t be going. The 504 gained that reputation through action, not hyperbole or mythos. The model is one of Peugeot’s most iconic and served the company in stalwart fashion for damn-near 14 years. Even Peugeot’s ending production at Sochaux couldn’t kill the 504, as it continued for another two decades in Kenya and Nigeria using Knock-Down Kits. I’d imagine that, should you look up the word tenacity in the OED there’s a picture of a 504 and nothing else. Everyone would naturally understand. This is a wagon, or Familial if that’s how you prefer it. That means its wheelbase gets stretched almost seven inches over that of its sister sedan, while the overall length increased by more than 13 inches. The American version is longer still than that of any other county’s as we got big rubber bumpers to protect insurance company profits the bodywork. The engine is here is typically European, a diesel, while the transmission, contrastingly, is as American as they come, a three-speed automatic. The diesel is a 69-horsepower 2,304-cc inline four while the console-operated slusher is by ZF. The curb weight of the car is around 2,950-pounds, so don’t expect any heroics out of that combo. In fact, you can probably consider that 80-mile per hour speedo to be aspirational at best. Despite those shortcomings in performance, this 504 more than makes up in the roominess and personality categories. I think it should punt on the swimsuit competition, however. The car looks to be in exemplary shape, with new champagne paint (originally white) over what’s claimed to be a straight, and rust-free body. All the trim is intact and the car sits on a nice set of alloys. The interior is equally nice as it comes with reupholstered front seats and decent coverings everywhere else. The seller says everything extant of the A/C works on the 43,000-mile car. The ad claims—as do they all—that the A/C may just need a recharge. Yeah, okay. A bunch of NOS parts and some new equipment—battery, alternator, fuel filter—accompany the car, as does a clean title. The price for all that is $13,000. You see, when I research these ads, I sometimes come across older attempts to sell the same item, or as in the case of this car, another currently-running ad. In this particular case, that ad is one with a wildly different price. Here is the Top Classic Sale ad for the same car, with the same contact info for the same seller, a dude named James. And there in that ad, he’s only asking $3,050. That’s almost a $10K difference! What, is Craigslist like the Rodeo Drive of automotive classifieds and hence demands a higher asking? Is Top Classics hence the Big Lots of the used car market? I don’t know but we’re going to vote on both prices. What do you think, is this car worth either $13,000 or $3,050? Or, is it a merde deal at either price? Nashville Craigslist, Top Classic Sale, or go here or here if the ads get pulled. H/T to Dustin for the hookup! Would You Pay $3,950 For This Quirky 1976 Saab 99GL?